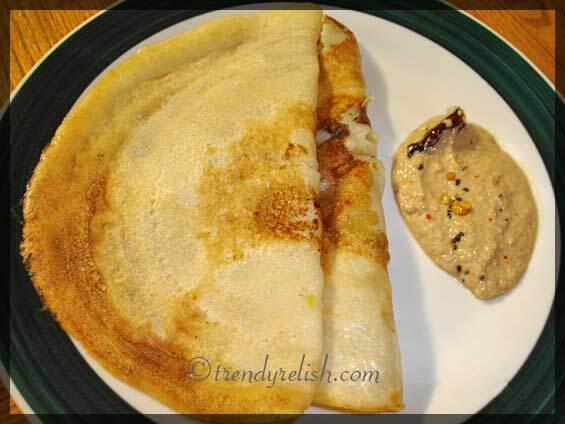 This is my most favorite kind of dosa and it is pretty easy to prepare. Mix the semolina and the maida with the buttermilk and the salt. It is better if the buttermilk is sour. The batter should be relatively thin in consistency. Let the batter stand for an hour. Chop the onions, green chilies, curry leaves and the ginger into small pieces and place in a plate along with the cumin seeds. Heat a pan and pour one ladleful of batter in the center. Spread to make a round flat pancake shape. Sprinkle some onions, green chilies, cumin seeds, ginger and the curry leaves mixture on top of it. Pour a little oil around the dosa, cover it with a lid and leave it for a while. After 2 min. take off the lid and fold the dosa in half and take away from the pan. Repeat the above process with the rest of the batter. 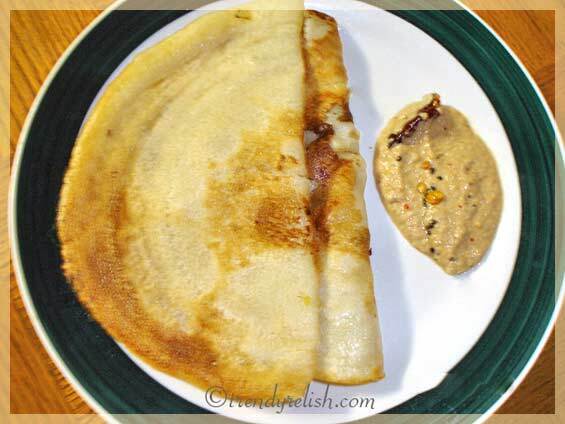 Place the dosas on a plate and serve along with Peanut Chutney. They taste better when they are hot. Rava dosa and chutney, what an excellent combo. lovely recipe. Wonderful combo. Picture looks perfect. Rava dosai and peanut chutney is my all time fav. My last Post was rava dosai . Yours look very nice. 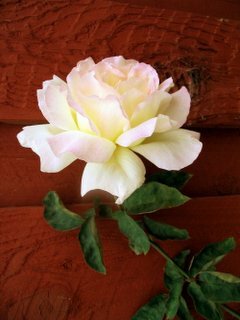 Pics are simply grt. Thank you for dropping the comment. U do have some typical Andra recipes i guess :) I love all the pickles and chutney of ur blog. Keep feeding some of ur recipes. I made such a mess out of my first attempt at rava dosa, but I've been collecting helpful hints. Putting a lid on the pan is a great idea to steam them. Thanks!